The 1st Fleet and the Silvius engage, with the Silvius’ vanship squadrons helping to break a hole through the line with bombs and smoke. However, the 1st fleet chases after them and the Silvius makes a run toward the Glacies border, taking heavy damage on the way. Meanwhile, Fam sees this as the perfect opportunity to catch her final vanship, but this time uses Millia as her navi. Both the Silvius and some Ades ships cross the border, and the Glacies forces engage the Federation ships. The Silvius uses the opportunity to slip away, but not before Fam is able to capture the flagship of the 1st Fleet. So the Silvius took heavy damage, but escaped, and Fam finally fulfilled her promise, but Giselle seems to have completely broken down that Fam was able to do this with Millia instead of her. I figure that bad things will happen once Fam gets back on board the Silvius. Of course, this also brings up the question of…where are the other ships, exactly? We know they were taken back to Anatoray, but where and why? We appear to be at a point in the series where it could really go anywhere. the main outstanding story arc – Fam capturing the 15 ships – has now been completed. One figures that some arc regarding Glacies is probably next. 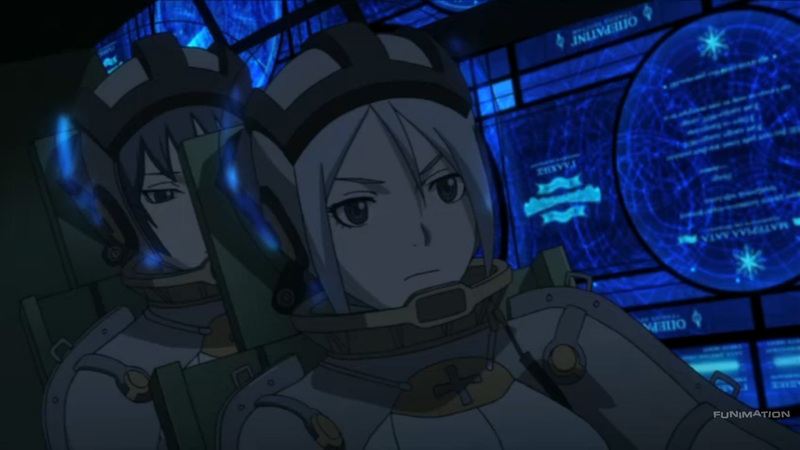 This entry was posted in Last Exile. Bookmark the permalink.